Frame: Rugged heavy-duty frame constructed of one-piece formed Channel steel offering lightweight strength. Forks: Reinforced for added strength with tapered ends for easy pallet entry. Hydraulic Pump: Quality German design complete with a special lowering valve allowing controlled rate of descent, and an overload by-pass valve. Pump Stroke: Features a full 90 degree top to bottom stroke - requires 10 strokes to raise the forks to the maximum lift. Handle: Featuring a reinforced base, the spring-a-matic handle returns to the upright position automatically. Control Handle: The control handle has three position (raise - neutral - lower) fingertip control. Ergonomically designed and free of pinch points. Steering: Features 200-degree pivot action for greater maneuverability, 7" polyurethane Wheels, sealed bearings and "Ball-Thrust" steering. Load Rollers: Features 2.9" polyurethane rollers with sealed bearings. Adjustable Push Rods: The adjustable push rods allow for individual adjustment capability of either fork height. Hangers: The one-piece hangers are constructed of steel for greater strength and longevity. 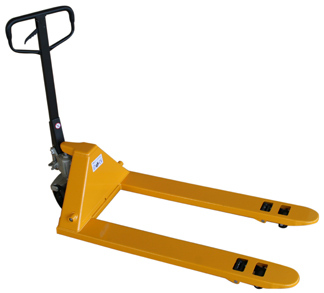 Helper Rollers: Features 4 helper rollers for easy exit and entry of pallets. Pivot Points: features grease fittings and bushings at all pivot points for easy maintenance. Foot Release: Allows user to lower load without using handle.